You know that a film is good when despite it being based on an ancient story, it has been twisted to incorporate modern sensibilities but you not only fail to notice it, and instead see the altered one as the real version. 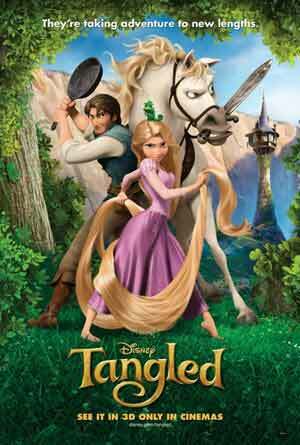 Based on the fable of Rapunzel by Brothers Grimm, "Tangled" is one such delightful fun ride of a film. After discovering a magic sunlight flower that restores her youth every time she sings to it, Mother Gothel kept it for herself. However, one day the king's men searching for the same plant for their dying, pregnant queen, take the flower away. The queen gives birth to a daughter whose hair has the same magical qualities that are lost if cut. So, mother Gothel kidnaps the girl and keeps her locked in a tower with only her long hair to lead her up, till one day a thief, losing his way, discovers Rapunzel. One of the most delightful things about the film is a story that even though you know, you realise you did not know. That is because the story has been twisted to match modern sensibilities. Consider this: in every version of the popular fable, Rapunzel is a commoner while her lover is a prince. The film tangles the story to reverse it with the girl being a princess and the boy, a thief. Two delightful side characters and their antiques remind one of the imaginations that made Disney popular in the first place. The first is a horse that is not only more of a dog with great sniffing capabilities and ability to wag his tail, but can also fight with a sword better than a man. Next is a chameleon, whose idiosyncrasies, colour changing abilities and long tongue provide much laughter. The beautifully written story and script also does not shy away from drawing up an analogy. Here it is of maternal envy. Though it is obvious that the motivation of Mother Gothel is mainly to keep Rapunzel for herself, it is can also be seen to denote mothers who scare their children with needless fears thus preventing them from reaching their full potential. "Tangled" is fun, witty film with characters that are as real as we find them in our life and yet charming. It has a story and execution that will not only please the majority, but also the discerning audience and critic. That in itself is a rare achievement. The 80-odd-year-old company Disney has been undisputed pioneers in the field of animation. Sadly, in the last two decades, with the advent of computer animation, they were finding it hard to find a solid footing. With their 50th animated feature "Tangled", it does seem that they have once again found their groove. Hopefully, they will delight audiences once again, with films like "Tangled" that is bound to go down in history as one of their finest works. That in itself is a very tasty proposition.